I’ll be one of several comic artists giving a short talk as part of the Graphic Brighton/Caption event this Friday evening. Do come along if you’re local; it looks like it’s going to be fun. Well, Graphic Brighton is normally a full scale academic comics conference; and Caption is usually an Oxford-based comics festival. I don’t know the reasons why, but I do know that neither of them is running in their normal format this year. Instead they’re coming together for this evening of talks and panels. At the Phoenix, Brighton’s office-block-turned-artists’-studios, from 6:00 to 10:00 pm on Friday. Admission is free but a £2 donation is appreciated. What are you talking about, Myf? Well that’s a question I’m asked often, but let’s assume you meant it literally. I’ll be giving one of the ‘lightning talks’ (we each have just a few minutes) and my chosen topic is the Draw The Line project. 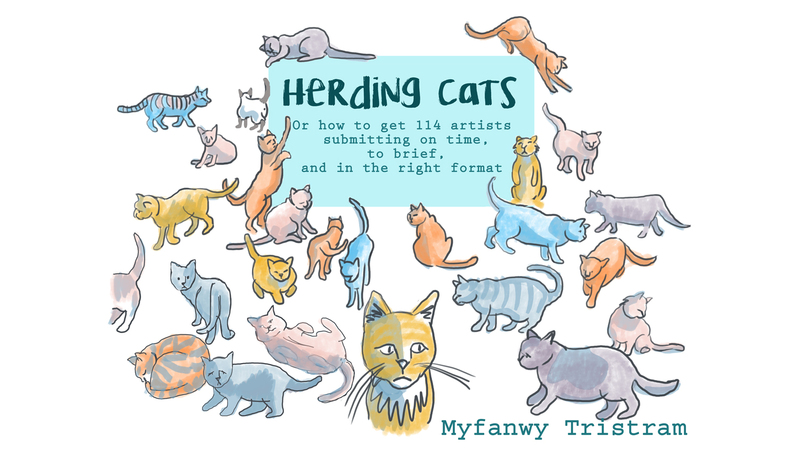 Specifically, I’ll be talking about how to manage a big comics project, a process which more than one person likened to ‘herding cats’, ie quite difficult and potentially chaotic. This is where it gets really good. You can see the whole programme here. As you may notice, the rundown includes many of the artists who contributed to Draw The Line, including Rachael Ball, Jaime Huxtable, Daniel Locke, Michi Mathias and Hannah Berry. A bit of cash, because all the artists (including me) will be selling their comics, and there may not be a card-paying option. I imagine drinks will be available on the night too.